What we’d read about the drive into Kalinga province was that it was the scariest ride many other travellers had experienced. Spectacular scenery, but fly by the seat of your pants nonetheless. We weren’t disappointed. The road that winds round the mountains opposite sleeping beauty is constantly subjected to roadworks and landslides. Most parts were sealed, but there was a healthy slab of off-roading. Considering the bus was packed I couldn’t help thinking it could easily overturn as it swayed dangerously close to the edge. I was sat next to a window on the cliff side, it was open from my waist to my shoulder, giving me a VIP view down the sheer drops and panoramic views of the River Chico. We stayed overnight in a town called Luplupa in a guesthouse run by a German man, though he was in Germany until February. Instead his welcoming sister-in-law and her husband took care of us. We ate with their family and had the guesthouse to ourselves, which came with two cockerels, the worlds smelliest dog and a family of ginger cars. The sickly runt Liam christened Ellen Junior. Charming. Luplupa is home to a guide called Victor. Victor has been a tour guide since 1976, but was also the town chief for 36 years until he stopped standing for office. He is a charismatic and knowledgeable guide. Everyone knows him, and he has an endless supply of anecdotes and dirty jokes. The next day we headed out on a two day trek with him. First we took a jeepney back along the cliff-side road (which had suffered a considerable landslide which all the male passengers pitched in to move) then we hiked into the hills to a town called Buscalan, all the while surrounded by ancient rice terraces carved into the breathtaking hills. 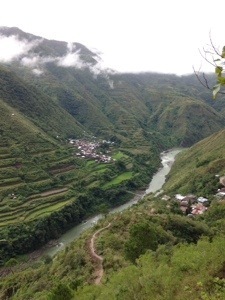 Buscalan is famous in the Philippines as the home of Fang Od. Fang Od is one of two remaining tattooing women in the traditional tribes, the other is not as famous. Filipinos, especially students, come from miles away to have traditional designs inked into their skin. 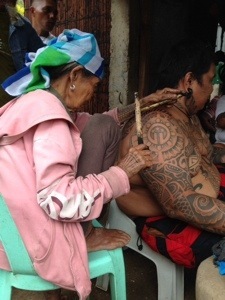 Some of the older tribes women, and head hunting men, are covered in tattoos, as used to be their culture. The lady herself uses her arms as a design book for her customers. Fang Od is now 94 years old and still tattooing. She has just passed on her knowledge to her niece, Grace. Grace is 17 and it has taken her 7 years to learn the skills necessary, she was the first to show an interest. They now share the customers. I had my first tattoo when I was 20. For my 21st my sister said she would pay for my next. She’s been waiting a long time as I have considered different designs and locations, always ultimately deciding against one. I am rapidly approaching a law career after all. Despite this I soon found myself sat, surrounded by most of the village (assuring me this wasn’t Malaysia – they weren’t prudes), wrapped in a sarong, being tattooed by Fang Od. I’d picked the Python design, a protective symbol which gives long life and healthy skin*. She tattooed using charcoal, a bamboo needle on a stick, and another “whacking” stick. Liam’s face said it all. As the recipient I didn’t find it all that bad. I’ve always thought I had a high pain threshold, and other than being a little uncomfortable it was a unique, totally bearable, experience. A heavily tattooed gentleman said he thought tattoo guns were more painful, his friend’s face on other hand said the opposite. Watching the video back, and then other people receive their art, I cringed at the sound. Luckily I’d been the first of the day, there had been no foreboding expectation, except concerned faces when I’d pointed to my ribs. We stayed overnight in Fang Od’s home in Buscalan, eating with her family, drinking gin** with Victor and sharing a room with Fang Od’s sister, nephew, his wife and son, and Victor. This was a homestay unlike any I’d done before. 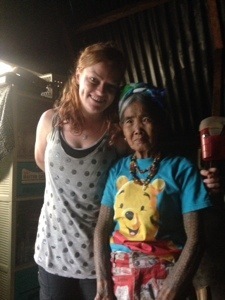 It wasn’t forced, we weren’t dressed in traditional outfits, and the children didn’t accost us with bracelets to buy. Everyone just went about their daily life around us, by 7am we could already hear the tattoo sticks beating together as more customers sat on the plastic stools outside. We left Kalinga province the next day, heading to Baguio a university town known as the summer capital. There’d been a huge landslide the night before and it took two hours for the machinery to clear the road for the jeepney. We’d run out of cash and had to bypass Banaue, where the most famous UNESCO rice terraces are, in order to hit up an ATM. That doesn’t mean they are any more impressive than the ones we’d seen, and I have to say the drive to Baguio was the most beautiful I have ever taken. I spent the almost whole six hours gazing out of the window feeling insignificant. Epic just doesn’t describe the mountains and valleys covered from top to bottom in rice terraces, carved centuries ago by farmers of the past. Yorkshire might be God’s own country but Luzon is his holiday home. * I’m sorry mum and dad, I assure you it’s discrete. I doubt you’d ever have found out if I hadn’t written about it. ** Filipino “gin” is not gin. It is an 80% clear liquid that smells like paint stripper. You drink it straight, with a glass of water on hand, often with meat chunks – their take on a pint and a packet of nuts perhaps.